Rapid advances in reproductive science and genetics have implications for prospective parents, especially concerning the types of testing options that may be available to screen for genetic risk factors. Some types of tests may be possible prior to a pregnancy being achieved, while others are carried out once a pregnancy is underway. Furthermore, certain tests such as preimplantation genetic diagnosis (PGD) require the use of assisted human reproductive procedures (AHR). This brochure outlines the process of preimplantation genetic diagnosis (PGD) as well as some genetic testing and screening options available once a pregnancy is achieved. Note that both the costs and the availability of reproductive genetic testing may vary across Canada. It is therefore important to consult your doctor or genetics clinic to find out what is available in your area and what is covered under your Provincial Health Care Plan. You may also have coverage through your private insurance or employee benefits program. Genetic testing detects variations in an individual's genes or chromosomes (hereditary material). A 'variant', or change in a gene might be important if it is related to a health condition. Why would individuals choose to have this testing? When a pregnancy has a greater risk for a specific genetic condition (for instance if there is a family history of the condition), PGD and prenatal genetic testing are options that allow individuals to find out if their child could develop that condition. 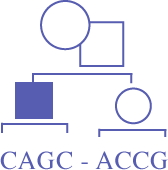 Genetic testing is not available for every condition and often, not possible unless the gene change is already known in the family. Given these and other limitations with genetic testing, and because not all health conditions are genetic, it is impossible to guarantee the outcome of a healthy child. Women who are at an increased risk to have a child with a chromosome condition due to their age. PGD is a technique used to test in vitro embryos for a specific genetic condition before they are transferred to the uterus. These embryos are created using in vitro fertilization (IVF) with or without intra cytoplasmic sperm injection (ICSI) techniques. (ICSI is a method in which a single sperm is injected directly into an egg using a microscopic needle). There are two methods of PGD: embryo analysis and polar body analysis. Embryo analysis: Following fertilization through IVF/ICSI, the embryos are allowed to develop until they reach the 8-cell stage of early development. One cell is then removed from each embryo and the genetic material found inside is analyzed. All cells within the embryo are expected to contain the same genetic information, so when a cell is removed the genetic material collected should reflect the genetic material present in all the other cells within that embryo. Once results are known, a decision is made about whether or not to implant the embryo(s). Polar body analysis: A polar body is a by-product of egg development before fertilization. The polar body can be removed and used to test the genes or chromosomes inherited from the female partner following IVF/ICSI procedures. Pre-natal genetic testing by chorionic villi sampling (CVS) or amniocentesis is usually offered as a follow-up in order to confirm the results of PGD testing. PGD may also increase the possibility of a pregnancy and live birth, as genetic and chromosomal conditions account for many natural miscarriages. Genetic screening and testing during pregnancy. Screening tests identify individuals with a higher chance of developing a particular condition compared to the general population. Prenatal screening identifies pregnancies with a higher chance of being affected with a chromosome condition (such as Down syndrome) or birth defects (such as Spina bifida). It is important to note that a screening test only provides a risk estimate and cannot confirm if the developing foetus has one of these conditions. Some screening options include: integrated prenatal screening (IPS), first trimester screening (FTS), maternal serum screening (MSS-quad), and obstetrical ultrasound. How do I feel about having a child with one of the screened conditions? Do I want to know if my pregnancy may be affected with one of these conditions? If my screening result is 'screen positive' (meaning at higher risk), would I consider pre-natal genetic testing to determine if my child will be affected? What is pre-natal genetic testing? Prenatal genetic testing refers to the process of testing a foetus for genetic changes. Options include amniocentesis and chorionic villus sampling (CVS). Amniocentesis: Usually carried out between 15-18 weeks of pregnancy and is associated with a 0.5-1% risk for complications, including miscarriage. CVS: Usually carried out between 10-12 weeks of pregnancy and is associated with a 1-2% risk for complications, including miscarriage. The identification and confirmation of genetic disorders is often undertaken by medical geneticists who are trained in the area of hereditary conditions. A qualified physician such as an obstetrician-gynecologist or medical geneticist, or a genetic counsellor can discuss screening options as well as how amniocentesis and CVS are performed. It is important to remember that most babies are born healthy; however, genetic conditions and birth defects occur in at least 3% of pregnancies, whether conceived naturally or through the use of AHR. How might a consultation with a genetic counsellor be helpful? In addition to your AHR service provider, genetic counsellors and medical geneticists are able to outline potential risks associated with personal medical history, family history, and the possible risks to a pregnancy that may occur with the use of AHR. Genetic counsellors and medical geneticists are trained to help determine who would benefit from prenatal genetic testing, and can help arrange testing for individuals who are interested. AHR specialists and other health care providers are able to make referrals to a medical genetics clinic if there is an interest in pursuing genetic counselling.